There is something about hearing the rhythmic flow of waves onto the shore and breathing salt-tinged air that inspires us to spend time on or in the ocean. The ocean drives our weather systems, is a source of oxygen, water, and nutritious foods, and even has applications to biomedicine. Blue water soothes the emotions, relaxes the mind, and invigorates the spirit. Many people feel that the ocean has unique healing qualities, even though they may not be able to explain exactly how that healing takes place. An informal study conducted at an aquarium found that only one in ten visitors could identify one way in which their health is affected by the ocean. In contrast to environmental issues, which are consistently ranked relatively low in public opinion polls, human health is often a chief public concern. Yet the public is virtually unaware that the ocean provides many positive contributions to human health. One of the most fascinating benefits is the research that is being conducted with marine organisms as they relate to biomedicine and human health. Marine organisms tend to have unique and varied mechanisms for defending themselves, whether it is by harboring toxins, or having antibiotic properties to fight bacteria and viruses in their environment. Scientists are currently studying mud puppies, fish that are highly resistant to pollutants, to see if their genetic makeup suggests ways to protect humans from pollution. Our ocean provides us with revolutionary pharmaceuticals: the cone snail produces a paralyzing toxin which is being used in modern medicine as a painkiller that is more effective than morphine, and is non-addictive. A compound found in a species of deep water sponge is being investigated as an anti-cancer treatment. We have inner ears almost identical to those of toadfish, so they are excellent research partners in studying balance. 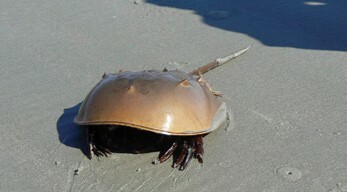 And if you’ve ever experienced an intravenous treatment at a hospital, there’s a chance that those fluids were tested for impurities by using a compound produced by the horseshoe crab. This animal is also helpful in teaching us about vision. Its eye has over 1,000 photoreceptors, which process visual information and relay it to the brain. In contrast, the human eye has only about 100 photoreceptors. • Sea urchins are helpful in understanding cell biology. They lay an abundance of eggs, and researchers are studying how their cells divide after fertilization. The urchin is being used as a model for studying fetal alcohol syndrome in humans. • Winter flounder is being used as a model to examine how kidney cells transfer toxins from the blood into the urine for excretion. • The spiny dogfish shark is helping scientists learn more about vision and fluid formation in the eye. • The squid has a huge axon, or part of a nerve fiber, which is 1,000 times larger than axons in vertebrates. Studies on nerve conduction from the squid are forming the basis for diagnosing and treating nerve disorders in humans. This is only a small sampling of the many different marine animals that are helping us learn about ourselves and our health. The field of biomedical modeling keeps expanding, as we discover more about the ocean’s inhabitants and the similarities we share with them. Research on the connections between our health and the health of the oceans is ongoing, but one thing is certain: we know that we have barely scratched the surface of this relationship. It can be humbling to realize how much we still don’t know, and sometimes it’s easy to feel overwhelmed by the numerous challenges we need to overcome to keep our ocean thriving. But we must also remember that there are many people dedicated to understanding this Ocean Planet, with the intent of managing it sustainably, and ultimately protecting it. Hopefully, the momentum of the oceans and health movement will continue, and we will come to appreciate the importance of taking care of our oceans, because they certainly take care of us. Melissa Ryan is the Project Manager at the Ocean Technology Foundation in Mystic, CT. She can be reached at Melissa.oceantechnology@gmail.com.